Welcoming the little bundles born to be stars! Prior to the wedding there was talk going around that Allen had to alter her gorgeous wedding gown to fit her new full figure, but Manivet says she knew in January that Allen wanted to get pregnant. After all, this was not the first time that Lily Allen had been expecting. The years 2008 and 2010 proved to be discouraging for Allen after she experienced two miscarriages. It seems as though life took a turn for the better with the start or 2011. 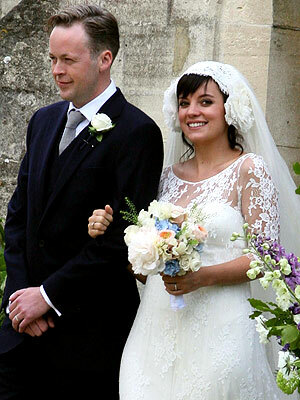 Lily Allen is now a married woman and mother-to-be! Previous Previous post: Poppy is a Busy Mommy! Next Next post: It’s a Boy for Tia and Cory! Laser Hair Growth Device: How Does Laser Help Grow Hair? Do you think UV/LED lamps can cause cancer? Removing your gel mani could save you time right? Did you know these habits are ruining your nails? Is Your Beauty Routine Safe For Pregnancy? Nailing The Right Polish Feels Amazing, Doesn’t it? Is Your Current Nail Polish Suitable For An Interview? What kinds of shoes are ideal for cheerleading? Tiger Wood’s Mistress: Off the Market and…Expecting? Birth name: John Christopher Depp II Born: June 9, 1963 (age 43) Location: Owensboro, Kentucky, USA Awards: Academy Award Nomination for Pirates of the Caribbean and Finding Neverland, Critics Choice Award Nominations for Pirates of the Caribbean and Finding Neverland, Golden Globe Nominations for Edward Scissorhands, Benny & June, Ed Wood, Pirates of the Caribbean I and II, and Finding Neverland, Screen Actors Guild Award for Pirates and Star on the Walk of Fame, and many other nominations. Copyright © 2019 Celebrity Babies.